Named for famous short-story writer, journalist, and novelist Ernest Hemingway, Hemingway Hall opened in 1970. It is a mixed class, coed, four bedroom suite-style residence hall. It features an Aerobic Center in the basement near the laundry facility, as well as a kitchen area in the main lobby. 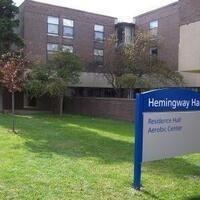 Hemingway Hall is located in the Andrews Complex.